Students at the Stung Meanchey school have classes in the Cambodian national curriculum each weekday from 7:45 am to 11:00 am. 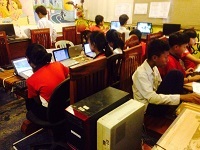 Those subjects include, Khmer Literature, Mathematics, Social Studies and Science. It also includes Life Skills and Sport. At the end of Grade 6 students sit the national examination for admission to high school. In recent years the pass rate has been 100%. English is not a part of the curriculum for Cambodian primary schools. However there is a strong demand for English lessons because fluency in English provides greater employment and study opportunities for Cambodian students. 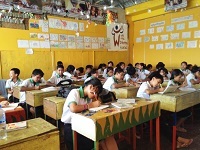 At all three schools there are English classes operating for three hours per day. At Stung Meanchey English classes are attended by students in the afternoon. At Borey Keila and Borey Santepheap 2 there are morning and afternoon sessions, with students attending public school for the half of the day when they are not at PIO. High school classes study English as part of the high school curriculum. All PIO students follow a set curriculum and are tested each month, with each level sitting a common test. The school uses the Let’s Go series of textbooks for Kindergarten through to Grade 6. High school classes uses the nationally approved textbooks. 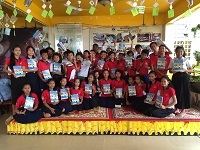 For many years PIO and its Sponsors have supported graduates from the Stung Meanchey school to attend high school and university. In 2016 PIO received approval from the Ministry of Education, Youth and Sport to run its own high school classes for Grade 7 and Grade 8 students. In the first year of operation over 80 children from Stung Meanchey and Borey Santepheap 2 schools have joined the program. The results are very encouraging and it is expected that this initiative will greatly improve the likelihood of students remaining at high school. In 2012 Ms Pagna Donlevy, a young Cambodian Mathematics teacher from the United States received an award enabling her to provide a mathematics program to PIO students based on the American high school mathematics curriculum. The classes operate each evening from 5 to 7 and are attended by older PIO students who are keen on mathematics and wish to improve their knowledge to a high standard. The program has continued for the past five years and has provided great benefit to a number of PIO students. PIO has an MOU with the Ministry of Labor allowing the school to provide vocational training. The number of classes offered depends on the availability of funding. In recent years PIO has run classes in Dressmaking, Information Technology, Traditional Dance and Art In addition the program provides work based experience for some of the older children that live at the PIO children. That training includes work as: a classroom assistant; library assistant, electrical work , driving and minor repair work at the schools. Children learn best when they are in good health. Therefore PIO runs a number of programs to ensure that the children attending the school have access to medical and dental care. With funding from Just World international PIO has a qualified doctor who operates a clinic at the Stung Meanchey school. 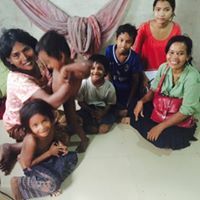 Dr Vuthy attend to over 300 students per month, providing primary health care and taking children to a hospital or clinic whenever further treatment is required. In addition to the regualar services of the PIO doctor, we have regular visits from nursing students and their supervisors from Monash University and the University of Newcastle in Australia. These teams work at the school for one to two weeks at a time assessing the health of all students and making recommendations for further treatment whenever necessary. 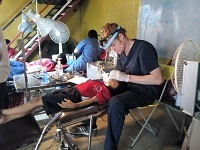 Dental services in Cambodia are very limited and often unaffordable for the poor. Consequently dental health is a major concern for all children. PIO is fortunate in that it has partnered with One2One, a health NGO operating from the School of Health Science at the university of Puthisastra and is able to provide regular dental treatment for its students. The program operates in three stages. The level 1 stage provides an assessment of their dental health and preventative treatments (sealant and silver diamine fluoride.) Level 2 provides some restoration work, and treatment of minor dental problems. For more serious dental issues the students are taken to the University of Puthisastra dental clinic where there are treated by senior dental students and teaching staff from the university’s dental school. An additional program funded by Just World International is the social worker program. The school has a social worker who visits families where there are problems which are preventing a child coming to school. Often, early intervention, together with practical support can resolve the issue and ensure that the child is able to continue their education.